If you want to escape the family, but keep in the holiday spirit, Tinsel is the place for you. The pop-up Christmas bar is up for its second year. In the words of Saturday Night Live’s Stefan, this bar has everything: chandeliers made of presents, a robot Santa, a wall made out of ribbons, Christmas card menus, cocktails in keepsake snow globes, hipster elves, and more. 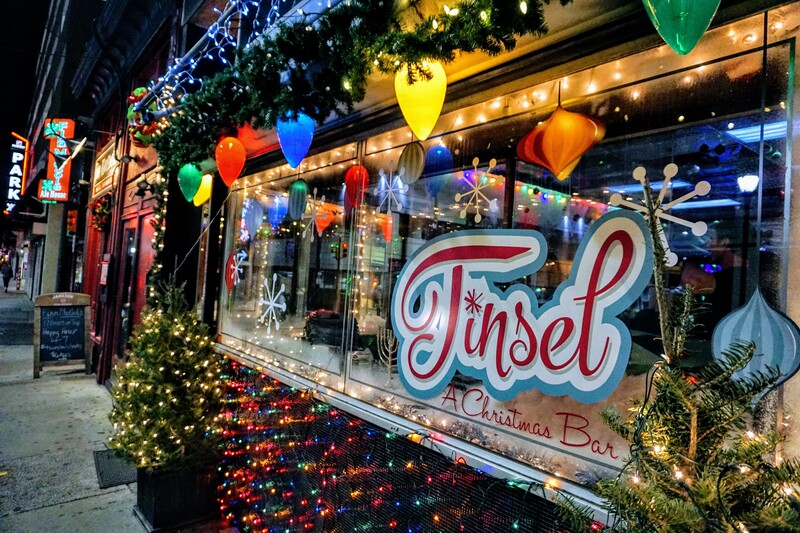 If you haven’t made it there yet, the good news is that Tinsel is staying open through New Year’s Eve and is throwing a big party to end the year and the pop-up’s season. Come for a five-hour open bar, complete with a DJ and snacks for $85 per person. Get your tickets here. The main drink attraction is the Snowglobe cocktail, which includes allegedly edible snow and comes in a keepsake mason jar with a toy. It is a fun concept, but the drink doesn’t taste like much, so save $18 and try the Warhol-esque “Canned Good” or the “Gingerbread Man” – both are tasty, Christmas-y and strong. If you’re not into the hard stuff, the beer selection is small but very good, according to my beer-loving companion. Obviously the atmosphere is great cheesy fun, but we also appreciated that we could actually hear each other talk and the acoustics were nice. We also noted that over two hours, we never heard the same Christmas song more than once on the perfectly-curated Spotify playlist.